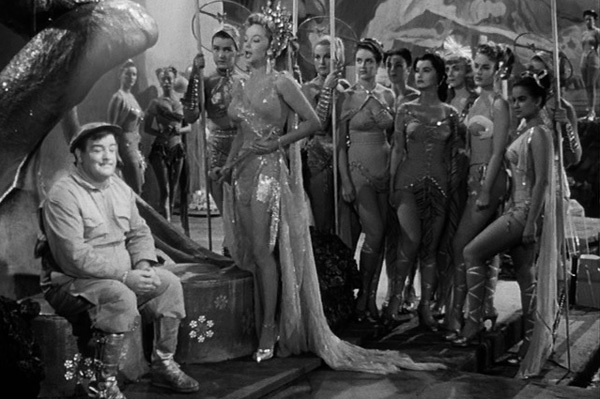 ABBOTT AND COSTELLO GO TO MARS —-they go to Venus, actually, but someone at Universal decided that the movie was so forgettable it didn’t even rate a title correction. Where the boys really go is downhill, with shenanigans and production qualities in this 1953 snooze that are lame, if you’re generous. Kids of that era may have put up with it, but today it’s hard to see how anyone over three would sit through its 77 minutes. Produced for $754,000, it was directed by Charles Lamont. Earnings of $1,250,000 had Bud & Lou landing not on Venus or Mars but crashing to Earth on spot #104 for the year. With Mari Blanchard, Martha Hyer, Horace McMahon, Jack Kruschen, Anita Ekberg ,Jean Willes, James Flavin and Harry Shearer. Several contestants of the then-current Miss Universe pageants are paraded as space cuties (Ekberg was Miss Sweden).